You may well have heard of gross motor development before, but what exactly does the “gross” part imply? And why is it important for you as a parent to know what the commotion is about – does it really impact on your child’s development? What does motor development have to do with your child’s ability to learn to read, or concentrate in class? Can sitting really influence communication later on? 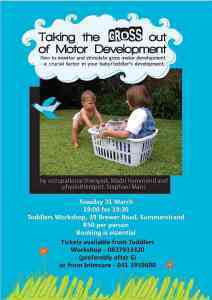 In this workshop presented by Toddlers Workshop and Intercare, we will aim to help parents understand what the basic building blocks of motor development are, and give practical advice and functional techniques regarding stimulation of these – in a format that should comfortably fit into any household’s schedule. Understanding the basics of early stimulation of motor development can help prevent later learning difficulties. Our hope is that proactive guidance may amplify your child’s potential. The workshop will be presented by Madri Hammond, occupational Therapist, and Stephani Mans, physiotherapist and mother of a young baby. Please join us for this workshop at Toddlers Workshop, 39 Brewer Rd, Summerstrand on 31 March 2009, 19:00 for 19:30. Tickets are R50 per person and can be obtained from Toddlers Workshop (0837933320) or from Intercare Medical Centre (041 3959600). Booking is essential.